CG: Tell us about your scarves. How did you come up with the idea? What are your inspirations? TH: I was walking through Nashville’s brand new Urban Outfitters and spotted a scarf-necklace accessory I thought to be brilliant! The price tag was more than I could afford, so I thought to myself… “I should try to make my version of this great accessory.” My husband and I went home and I immediately started constructing the very first Hamilton. A desire to have the current “it” item brought out my creativity. 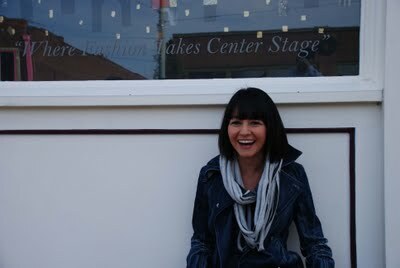 With the infinity scarf being fall ’09s pop item, I devised my own interpretation of this trend. Each scarf is handmade out of either recycled fabric or season specific fabric. My inspirations come from all kinds of outlets- from walking through the fabric store to putting together an outfit and realizing what is missing that I can create. CG: How long does it take to make a Hamilton? What materials do you use? TH: The entire construction process takes roughly an hour- depending on what fabric is used and the detail of the hand-stitching. My scarves vary in fabrics and color. Jersey, sweatshirt fleece, anti-peel fleece, faux suede, plaid flannel and stretch velvet are the current fabrics in my product offering. The best sellers are plaid and sweatshirt fleece- casual fabrics to add that final touch to your look. CG: What are some of the challenges you’ve faced as a designer? How have you overcome these challenges? TH: My largest challenge is having enough time to keep up with orders. This holiday has been quite busy- scarves are awesome gifts, especially those that are handmade! I mostly devote my weekends to production and see to it that all orders are shipped within one week of placing the order. When I am feeling overwhelmed with a time crunch, I always remember to feel blessed and give gratitude for my ability to create accessories and be inspired by fabrics. CG: Where can people view your collection and buy your Hamiltons? TH: Locally, in Memphis, TN, Indigo in Germantown has an assortment of my collection. In Nashville, TN, Posh Boutique has a full range of the collection. Online, you can see Hamilton on my facebook page as well as my blog: www.terrahhamilton.blogspot.com Orders can be placed by email at terrahhamilton@gmail.com. CG: How do you stay healthy during a crazy holiday season? TH: My health motto is Everything in Moderation. I listen to my body and pay attention to the internal dialogue shouting to me if I overeat or indulge in desserts. I do not believe in denying yourself your favorite foods. You just have to keep in mind the portions you are eating and be conscious about what nutrients the food you eat is providing your body. My husband is great about being involved in the kitchen and spending time with me while grocery shopping, which I believe is a positive influence on my healthy eating. Living an active and busy lifestyle keeps the pounds from sticking. 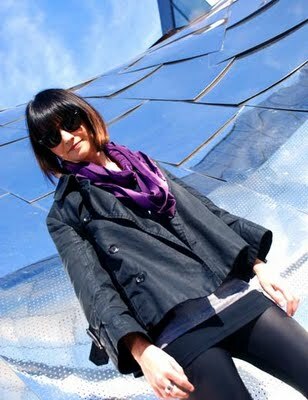 Cool scarves– love that purple color!